Four faculty members honored with $25,000 Tow Professorships to support cutting-edge research, ranging from the expansion of the canon of Italian literature to the creation of art with a unique focus on social justice and the human condition. 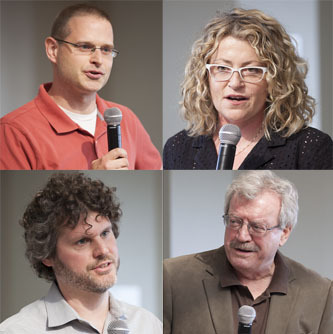 Clockwise from the top left: Professors Aaron Kozbelt, Patricia Cronin, Luigi Bonaffini, and Jason Eckardt were each awarded a Tow Professorship to continue their projects. Four Brooklyn College faculty members have been awarded Tow Professorships, which provides $25,000 to each awardee in support of exceptional new and ongoing projects. "We are pleased to bestow this well-deserved honor on these talented individuals," says President Karen L. Gould. "These are just four more examples of the unique and outstanding work of our stellar faculty." Professor Luigi Bonaffini, chairperson of the Department of Modern Languages and Literature; Professor Patricia Cronin '88 M.F.A. of the Department of Art; Professor Aaron Kozbelt of the Department of Psychology; and Associate Professor Jason Eckardt from the Conservatory of Music are being acknowledged for outstanding scholarship and creativity in their fields. Past Tow professors have been from the fields of chemistry, biology, classics, history, anthropology, Africana studies, and English. Bonaffini, an internationally recognized translator and scholar of dialect literature and literature of the diaspora, recently published Poets of the Italian Diaspora, a 1,500-page volume that took seven years to complete. "The work is part of a larger project that aims to expand the boundaries of traditional Italian literary canon by adding dialect poetry, the literature of the diaspora, and the literature of migrant writers, which is a relatively new phenomenon," says Bonaffini, who has written and translated more than 40 books on and by Italian poets, and is editor of the Journal of Italian Translation. In the next two years Bonaffini plans to organize an international symposium on the Italian diaspora, in either the United States or Italy, and publish a second volume of the diaspora anthology, focusing on prose writers. Gaining notoriety in 1993 for "Girls" and "Boys," a mixed media exhibit of Polaroids and watercolors that showed sexual intimacy from the vantage point of the participants, Cronin has continued to explore, over the past two decades, such themes such as gay and lesbian representation, the recovery and writing of women's history, the relationships between feminism and contemporary art, and social justice and the human condition. A recent Rome Prize winner at the American Academy of Rome, Cronin's upcoming solo exhibition at the Centrale Montemartini Museo in the capital city will raise her profile as a feminist artist who continues to challenge, among other things, entrenched concepts surrounding the place of women in the world and history. "I'm pleased and honored to receive the Tow Professorship at precisely this juncture," says Cronin. "I can now be even more ambitious, and make the exhibition larger and richer; something I could not have done it without this resource." Kozbelt's groundbreaking work on creativity and cognition in the arts has challenged, using rigorous empirical and quantitative methodologies, some well-established theories in his field. He is a co-recipient of a National Science Foundation grant of $698,992 with Computer and Information Science Professor Scott Dexter. Kozbelt is also a co-organizer of the 2014 biannual meeting of the International Association of Empirical Aesthetics, to which he plans to devote a portion of the Tow Professorship funds. "On a personal level, much of what I plan to do over the next year is a consolidation of past work and a reappraisal of where my research is going," says Kozbelt. "One of the ‘big' questions I'm interested in tackling is understanding the structure of the creative process in visual art in a way that informs the nature of creativity and in a way that also gives insight into how any new things come into existence." A leading composer in the "New Complexity" style, music that has been called atonal, dissonant, and highly abstract, and that uses techniques that require complex notation, Eckardt has distinguished himself both nationally and internationally. A recipient of both Guggenheim and Rockefeller Foundation fellowships, his works are constantly performed in major cities both at home and abroad. Eckardt's many commissions—including those from Carnegie Hall and Tanglewood, some dozen commercially released recordings, and publication of his scores by the renowned publishing house Carl Fischer music—place Eckardt at the top of his genre and squarely in the annals of American music. "I will be completing a piece for piano quartet commissioned by the Koussevitzky Foundation that will premiere in Salt Lake City in February," says Eckardt. He will also be traveling to Europe, where he will be researching extended instrumental techniques in Paris and Strasbourg for a new concerto for flute and chamber ensemble, and overseeing performances this fall in Milan and Arrezo. "The Tow Professorship will make all of this possible by underwriting the recording and production of my music as well as facilitating travel," he adds. The Tow Professorships are made through the sustained generosity of alumni Leonard '50 and Claire '52 Tow. Over the years the couple, through the Tow Foundation—overseen by Emily Tow Jackson, the executive director and the Tows' daughter—have demonstrated their deep commitment to their alma mater in the form of endowments for student internship programs, student scholarships, and faculty travel fellowships, as well as undergraduate travel stipends for students to do research outside of the United States. The Tows, who met as students at Brooklyn College, also donated $10 million for the construction of the Leonard & Claire Tow Center for the Performing Arts, a rehearsal, production, and performance space projected to open on campus in 2014.